Hg4f region has well separated spin-orbit components (Δ=4.0 eV). Name Origin: Names after the planet Mercury. 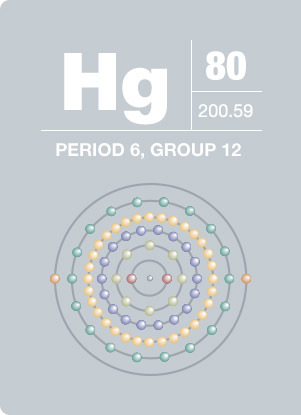 The origin of the symbol Hg is the Latin word hydrargyrum meaning "liquid silver"
Mercury is one of the three elements that are liquid at room temperature. Mercury is used in thermometers, barometers, and other laboratory equipment, however because its vapor, compounds, and salts are toxic, most thermometers use pigmented alcohol instead of mercury. Mercury is still used in medical thermometers to ensure better accuracy. Mercury has been found in Egyptian tombs from 1500 B.C. Mercury nitrate was used to remove the fur from animal skins to make hats. The constant exposure of the hatters to mercury nitrate caused many cases of brain damage which is the origin of the saying “as mad as a hatter”. This led to the creation of the Mad Hatter in Alice in Wonderland.